The Pac-12 is looking to bounce back from a difficult postseason, and banking on some new coaches to provide a spark. Jon Wilner of the San Jose Mercury News joins AP's Ralph Russo to preview the conference and size up whether it can get back into the College Football Playoff. Washington looks like the favorite. USC might turn to a freshman quarterback. Can Bryce Love break through and win a Heisman? New Miami coach Manny Diaz grew up in south Florida when the Hurricanes were king. Now the son of the former mayor is the 'Canes head coach. He hopes his connection to the program and community can help bring Miami championships again. Diaz joins AP's Ralph Russo for an interview that ranges from his Miami roots to working the transfer portal. Tough Jobs: What new coaches have their work cut out for them? Stepping into a new job is always challenging, but what new coaches have the toughest tasks ahead of them in college football? Bruce Feldman of Fox Sports and The Athletic joins the AP's Ralph D. Russo to talk dirty jobs and heavy liftiong. Nobody seems to have his work cut out for him more than Scott Satterfield at Louisville. Mike Locksley at Maryland is also walking into a tricky situation. Bruce and Ralph also discuss which new coaches at Group of Five schools could be the next rising stars and what first-year starting quarterbacks could be ready to break out the way Kyler Murray and Tua Tagovailoa did last year. Plus a little Tiger Woods talk. Big Ten breakdown and Saban's "rant"
With the college football championships out of the way, it's time to turn back to football. Bill Bender of The Sporting News joins the AP's Ralph Russo to talk about the first look at quarterback Justin Fields, playing for Ryan Day's Ohio State program. Plus is this finally Jim Harbaugh's year to beat the Buckeyes? And which of 2018's surprise teams _ Washington State, Syracuse, Missouri _ can build on their successes, and which will regress? Also, Nick Saban's so-called rant about players leaving early. How will Hurts fit with Oklahoma? Oklahoma's latest transfer quarterback held his first news conference and he sounded a lot like his old coach. Jalen Hurts has a new home in Norman, but George Schroeder of USA Today says the former Alabama quarterback definitely sounds like a product of Nick Saban's machine. Schroeder joins AP's Ralph Russo to talk Hurts, the growing gap between the American Athletic Conference and the other Group of Five conferences and why the SEC made a concerted effort to get better in basketball. Plus, which SEC coach is a better long-term stock: Chad Morris of Arkansas or Jeremy Pruitt of Tennessee? What to make of Tate? Miami got good news last week when it found out transfer quarterback Tate Martell would be eligible to play this season for the Hurricanes. At least it seemed like good news. Paul Myerberg of USA Today joins the AP's Ralph Russo to discuss what to make of Martell, a former blue-chip recruit who played sparingly at Ohio State. Who knows how good Martell will be, but he has to be an improvement for Miami. Right? Myerberg talks spring storylines from Virginia to Texas to the state of college football in Los Angeles. Plus, Jeff Brohm or P.J. Fleck? Who ya got? How will Notre Dame follow-up its first College Football Playoff appearance? What are the odds both Alabama and Clemson have unbeaten regular seasons? Sure, the NCAA basketball tournament is about to start, but spring football is in full bloom. ESPN's Adam Rittenberg joins AP's Ralph Russo to look toward possible overachievers and underachievers for the 2019 season. How will second-year coaches Scott Frost, Willie Taggart and Chip Kelly do after losing debuts? And what quarterback competitions need to be sorted out this spring? 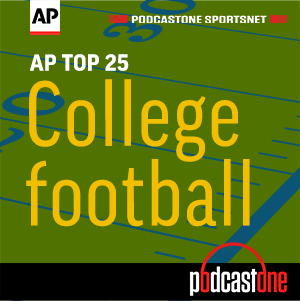 It's the college basketball edition of the AP Top 25 College Football Podcast. AP national basketball writer Aaron Beard joins Ralph Russo to preview selection Sunday and sort through who the top seeds might be in the NCAA Tournament. What does Duke have to do to gain a No. 1 seed, and where should the committee place the Blue Devils if star Zion Williamson can't show that he is healthy at the ACC Tournament? Plus, which schools outside the big contenders look capable of making a long run in the NCAA and should the committee put more mid-major teams in over Power conference squads with mediocre records? The NFL combine is over and the most important thing we found out was Kyler Murray is not that short. Dan Brugler, NFL Draft analyst for The Athletic, joins Ralph Russo to discuss which players helped themselves at the combine and whose stock might have dropped. Plus, how is combine evaluation changing now that intense training and preparation for it is so common? The athletes seem better than ever. Does that mean the scouts need to adjust their expectations? Brugler discuss avoiding group think and some of his favorite under-the-radar prospects. A decision is expected soon in a court case that could bring dramatic changes to the NCAA. Dennis Dodd of CBS joins AP's Ralph Russo to discuss the so-called Alston Case, which challenges the NCAA's rule against compensating football and basketball players beyond a scholarship. Dodd explains what's at stake and how schools have been quietly preparing for a decision that goes against the NCAA. If so, rules on player compensation could fall to the conferences. Is it the end of college sports or just a continuation of a trend? Stanford coach David Shaw is one of the college football's most insightful coaches, with well-thought out opinions on big-picture topics. He also is about to begin a three-year term as chairman of the NCAA football rules committee. Shaw joins AP's Ralph Russo to discuss why he thinks the targeting rule needs to be changed, and how. And tweaking overtime rules to lessen the chances of marathon games. Plus, why he believes the transfer portal could be hurting more athletes than it helps. Shaw also shares some insight on the increasing number of players leaving school early for the NFL and why even great college players might not be ready to compete for a job.